Tethatu is the name of the highest initiation one can reach in the healing traditions practiced by the Magyar people, and roughly translates as ‘one who talks with the dragons’. Dragons are our strongest helpers, and the last ones we meet on this spiritual path, after tree spirits and herb and flower spirits. These traditions have three parts or bridges, and each part has its own specific helper spirits. The first helpers we work with are the tree spirits. These give us the first bridge, the bridge of death. This is so called because at this stage the shaman must experience his or her own death in order to release all of their resistance to the inner worlds. Our normal doorway into the next world is through physical death, and it is our fear of death that keeps us bound to this world. Once we have faced death, we have easy access to the next world, the unconscious or underworld. The healing work done at this level is similar to the shamanic or underworld journey. This healing is done to retrieve lost fragments of the soul, release entities, solve conflicts in the unconscious mind, and break down the elemental energy of past traumas, suppressed emotions, and negative patterns and habits. The reason why tree spirits act as our allies here is that it is considered they have their main existence in the astral plane. Having no physical movement, the physical tree is just a centre for the spirit which has an active life on other planes. Tree spirits have a far greater mastery of the underworld than we can ever achieve, and this makes them powerful allies in our journeying work. When a tree spirit wishes to work with a person, it will subdivide, in a kind of fission form, like an amoeba, so that a separate spirit can live in a single branch. This spirit is not like a child, but has all the wisdom and experience of the original tree spirit. It then calls the shaman to cut that branch from the tree and use it. The size of the branch can vary. To produce a wooden bead wearable around the neck, or to make a full-sized staff both require different amounts of wood. Tree spirits are not limited to space, a large spirit can be within a very small branch. A shaman usually has a number of tree spirits carried on their person, and communicates with them continuously while working. They help to guide the shaman when he visits other worlds on a shamanic journey, also each species of tree has particular specialities in the kind of healing they give. These traditions work with thirteen different trees: Birch, Rowan, Ash, Alder, Willow, Whitethorn, Oak, Holly, Hazel, Apple, Blackthorn, Elder, and Yew. These thirteen trees represent our growth from conception to birth, infancy, adolescence, adulthood, and finally death. The second bridge we cross is the bridge of chaos. This is so called because we have to go beyond logic and reason and stop trying to make sense of the universe. There is a great deal in the universe that is not logical or rational, and if we demand things make sense, we cannot enter the next realm – the imaginal realm. This realm does not fit anywhere in our picture of the three shamanic worlds – the lower, middle, and upper worlds – rather it is a place of ‘wild unharnessed creativity’. Here imagination imagines itself. When you enter this realm, you will find your vision is clearer than ever before, with everything in brilliant technicolour. This is because it is not you who is imagining, but imagination itself communicating with you. When we give healing from this level, we are no longer concerned with the past, but with the future, because we can see that the cause lies in the future. In the normal creation process, we first decide the effect, and then go back in time to add the cause. We tend to forget that we created the cause, because of the consensus belief that cause is in the past. Once we are outside of time, we can see through the illusion of this belief. Intent is the most powerful creative force here. It is intent that makes us hold onto the causes. We are what we are now not because of the past, but because of the future that we are becoming. This perception is agreed with by quantum physics, which sees every experience as a double quantum wave between here and the future. If something did not have a future we could not experience it. Healing consists of weeding and cultivating futures. We can see many possible futures affecting a person, all competing for attention. All forms compete for food so they can grow; futures exist as astral forms that feed on the mental energy of the attention you give them. Whatever forms get your attention feed of your mental energy. The ones that win grow stronger until they manifest physically, while other futures die and never manifest. The healers work here to destroy negative futures, redirecting the energy to the positive futures, and helping them to grow. The effect of this is felt immediately as it effects who you are now. Our allies at this level are herb and flower spirits. These spirits live outside of linear time and therefore move in touch with future causality. Like tree spirits, the healer allows the herbs and flowers to call to them, so that when he takes them they still contain the spirit. The healer then dries the plant and wraps it in small pieces of cloth with a mark drawn on it to remind him of which plant it is. He can then carry the herbal charm bags ready to use in healing. The third bridge is called the bridge of belief. This is because nothing here can ever be proven, and only the strength of our belief can carry us on. All the helpers here are entirely non-physical and unprovable. Traditionally they would be elves, fairies, and dragons. Many people who learn this system without the limitation of its original tradition find other non-physical helpers such as angels, devas, and the gods of various religions. Dragons rule the primeval forces of creation and destruction, and protect the divine plan of evolution. Fairies provide joy, pleasure, and sensitivity, and give our lives more depth. The two balance each other, providing a well-balanced, happy life, with emotional and physical wellbeing. These beings influence our lives without us knowing it and becoming aware of it enables us to enhance our experience of life. The realm this bridge leads us to is called the Ginnungagap or magically charged void. It is hard to describe but contains all potential and all form. From this plane we see all beings as simply patterns of energy, and by working with the fairies and dragons, we can destroy negative patterns and rebuild the light matrix of a person’s soul, re-weaving patterns that seem to be faulty or distorted. When working in this way, the healer often does not see the physical body of the patient, as he is in a trance seeing only the changing energy patterns. Observers who are present however sometimes comment on impressive physical changes in the patient, such as large lumps of calcification quickly dissolving or hernias drawing back into place and healing. This work also produces subtle changes in the patient’s personality, but its real value is more mystical: it puts people in touch with their true will and purpose. My 10 weekend Tethatu Shamanic Healing – Shamanism Training begins with an introduction to working with tree spirits and cutting your own live wood wand. I offer weekend workshops in Dragon Magick and also work with dragons more extensively in my Magick – The Faery & Dragon Path training. Visit my Tree Spirits and Livewood Beads, Magic Charms and Flower Essences pages for further support on your jouney. 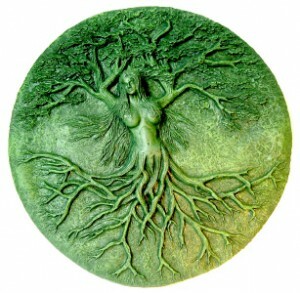 When a good connection is made and fostered, plant and tree spirits are often very willing to help us and there are many ways of working with plant and tree spirits to draw healing and positive energy. These include flower and other vibrational essences, one of the most popular and effective forms of plant shamanism. Few realise the great antiquity of this type of medicine or its magical nature. The success of Dr Bach’s brand of flower essences have increased public awareness of these essences, and promoted a technique of making them by placing blooms into a glass bowl of spring water for several hours in direct sunlight. But there are many other techniques. The best essences are made with the conscious participation of the plant spirits involved, and can be made in a variety of ways, preferably following instruction from the deva itself. Vibrational essences work in the same way as direct devic contact, by overlaying the persons vibrational pattern with that of the deva/ dryad and drawing into a more positive state. All vibrational essences utilise the unique energetic and spiritually catalytic qualities of fresh spring water to hold the ‘pattern’ of the plant spirit, thus the spring water aligns with the water in the body, infusing it with the plant spirits vibrational pattern. Vibrational essences can be made with all manner of nature spirits, stones, ‘powers of place’ and weather fronts for example, but essences of plant spirits are the most common. Thank you for your informative comment, April. I go a lot deeper into building such connections and preparing most powerful essences in the book “Spiritual Allies from the Plant Kingdom“. there is a lot more information on this topic in my book, “Working with Tree Spirits in Shamanic Healing“. Below I have listed specific trees and their healing properties, physical, emotional and psychic that grow in different parts of the world. Trees from different lands can also be found in Botanical Gardens or arboretums so that wherever you live you can touch them and absorb their healing powers. Hi Guillermo, thanks for the extra information – please would you add the link. I am sure my readers will find it useful. what about working with sylphs.I believe I have many sylphs in my home. they’re always blinking in and out and sparkling everywhere. they seem to have came last year during the super moons. how can I communicate with them. I communicate with them telepathically and tell them hi and that’s when they show themselves and start blinking everywhere. is that normal to have a bunch of sylphs floating around in your house. I wonder they must be in everyone house and they just can’t see them. I’m surprised they stay in my house and do not leave. I read one of your articles and was hoping and thought it would be great if I.could somehow if I’m worthy receive some kind of token,stone. pearl, object to either help heal, something magical or who knows. what I absolutely would love to attain more then ever is a dragon pearl. I was looking on that website where I found you there’s so many types I don’t even know where to begin and how to choose what’s best for me plus they’re so expensive I’d like to save money and buy one of the ones for sale that are slightly damaged but supposedly still have power and see what it does for me. Sylphs can appear anywhere. It is actually mental activity that draws them in. If your thoughts are freindly to them, and ofa high level, they come. You can also make them offerings of scented flowers to attract them. Amazing article! your writings always clear away a lot of questions in my mind. Thank you so much for sharing such valuable knowledge. As u mention the plant and herb spirits, is consuming a hallucinogen herb or plant ritualistically also a mean to communicate with the spirits of those herbs and plants? Like consuming psylocibin mushroom, one at times do see everything as energy patterns, but one doesnt knows how to get rid of a negative pattern, so is it the same planes? also the dragons, are these the same dragons which a lot of western spirit conjurers talk about. The red, black and gold etc. the javanese magick also includes conjuration of dragons of different colors as well. are these all dragons one and the same? Yes, you can gain communication with the plant spirit if you focus on it. The purpose of using plants ritually is to direct the energy somewhere useful. You can pray for healing, vision or particular magickal initiations while ritually using plants.Dragons are basically the same all over the World, although different cultures come up with different anmes for them.